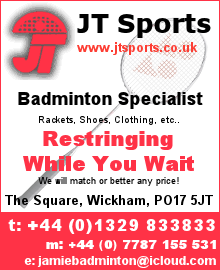 Welcome to the Southampton and District Badminton Association website. Please select an option from the menu. League tables are now ready for the 2018-2019 season. Please note the new Mens Fours Division 2. More.. The AGM will be held on the above date at Victory Hall, Warsash. More.. The Tournament will be held on 20th May 2018 10am to 2pm, please get your entries in now. More..